What the hell is that? It's a sandwich. Really, it is. One of the sloppiest ever. 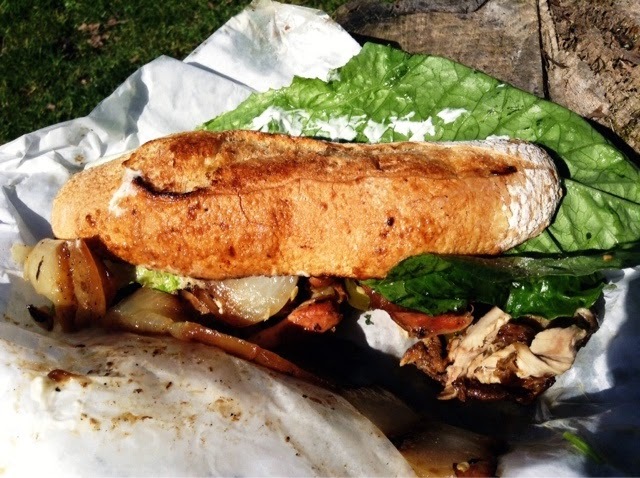 Grilled and roasted skin-on chicken thighs, inch wide ribbons of roasted onions, cilantro, aoli, jalapeños and a giant leaf of romaine on a chewy toasted baguette. The bread cannot contain the heap of food. From Paseo on Freemont Ave. in Seattle. There was an hour wait in line outside in the sun. I ate this while sitting on a stump in a park today, trying in vain to protect my clothes from stains. The magnolias, forsythias and plums in ridiculous splendor.